Prevalent models like Lean Startup, Design Thinking, Jobs To Be Done etc. all stress a primary need to understand the end user of the product. In fact, it’s hard to find a contemporary ’best practice’ example of design or product development which doesn’t include ‘getting out of the building’, ‘walking in their shoes’ or having ‘empathy’. …But there’s little thought given to the customer of user centred design – the business decision-maker considering investing in the often unquantifiable value this approach will bring, and wanting assurance they’re doing the right thing by leading their team down this path. Who’s walking in their shoes? Where’s the empathy for them? Being a coach with Better by Design certainly takes this direction, and joining 25 Kiwi CEOs on a tour of NY businesses offers a great opportunity to take a taste of my own medicine by getting closer to my own customers. The businesses we’ll visit have all been built on or have adopted a customer centred approach, from mainstays like Ideo & Google, to more ‘recent’ arrivals IBM (who’ve hired hundreds of designers in the last year) and a bunch of more ‘Kiwi sized’ product and service companies. At each business we’ll get a taste for their approach and hear how they believe they’ve applied it in their business, through staff culture, product attributes or the way they decide ‘what next?’. Yes, a great set of case studies to learn from, but my interest lies in the response of the curious but yet-to-be-convinced CEO or Product Manager who’s perhaps too close to their product or has lost connection with their customers’ world. What does a user centred approach look like to them? I’ll be looking to see what resonates, what scares them, what raises eyebrows, or triggers an inhale through the teeth. Plenty to learn, and as with all customer insights work, the answers to these questions lie beneath the surface and between the lines. So if you’re in New York in Late October, that’s where you’ll find me. Oh, and I’ll be speaking at New York’s UXLab hosted by Motivate – so hope to meet some locals for another kind of learning opportunity. This entry was posted in Better by Design, User Centered Design, UX happenings by Nick. I love a great metaphor, like this one from the 2015 Better By Design CEO Summit. The speaker likened an organisation to a growing sphere to illustrate how organisations can lose touch with what happens out in customer-land. “Information enters and leaves organisations at the interface to the outside world. If you think of an organisation as a sphere growing over time that interface to the outside world is the surface area of that sphere while the internal organisation is the volume of that sphere. 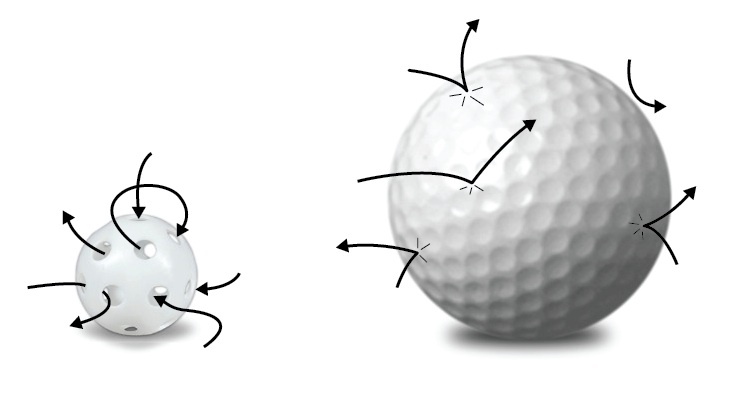 If you look at the ratio of surface area to volume, it reduces to 3/r where r is the radius or distance from the centre of the sphere to its surface. If you imagine the senior team of an organisation at the centre of the organisation, the unfiltered information that they get decreases with growth. Ok, so I’m not really across the 3/r bit, but the picture he paints is clear to me – of organisations as spheres, becoming victims of their own volume, less able to breathe insight from the outside world despite their greater ‘surface’ area. … and here I was thinking pie was 3.14 times the diameter of the pastry minus the hypotenuse of the gravy! This entry was posted in Better by Design, Customer insights, Observations by Nick. The second half of the year was no less exciting with client work, but was boosted by the buzz of my own product hitting it’s stride in the market. From July to December: Home brewing, TV, Mr. Tappy and Motorhomes. Location: Portland, Oregon. Micro brewery capital of the world. Client: imake / (Part of the Better by Design programme). 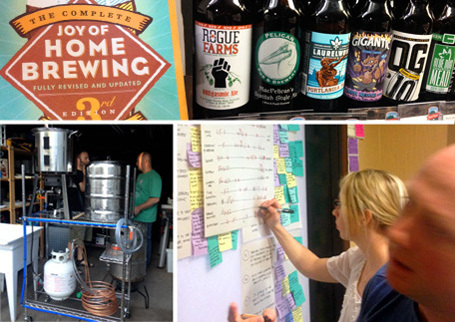 Portland is the world’s capital of micro breweries and craft brewers. Visiting with imake’s team from NZ, Australia and USA, we stepped inside the garages, basements and minds of craft brewers, aiming to understand what makes them tick, and how they approach brewing. 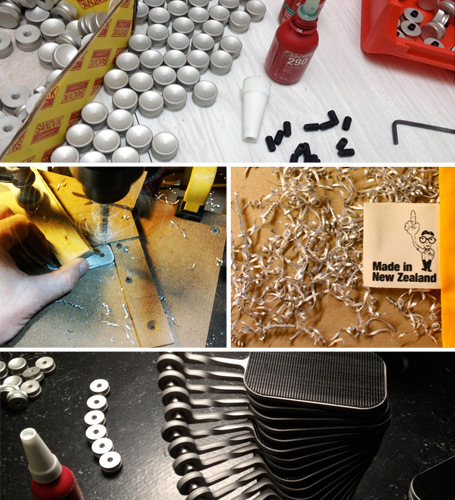 My role as part of Better By Design is to help build design capacity within NZ export companies like imake. In many cases this starts with understanding customer needs, so getting out in the field like this was a perfect first step towards customer empathy. In Oregon, I briefed the team on how to get the most from contextual interviews, supported them in the field, then coached them through collaborative analysis. A deep dive into brewing culture, but my satisfaction came in that it was the client team who drew out the insights and identified opportunities for marketing and product development. 6. How do you view? A classic contextual study in homes around NZ to understand how TV fits into people’s lives and how? / when? / where? / why? they get their fix. Having run studies like this for BBC and SKY in the U.K. back in the late noughties it was super interesting to see shifts in consumer expectation and behaviour. Back then it was ‘time-shifting’, now it’s ‘omni-screening’. From devices to content sources, this felt like a ‘snapshot in time’ in the dynamic landscape of TV. 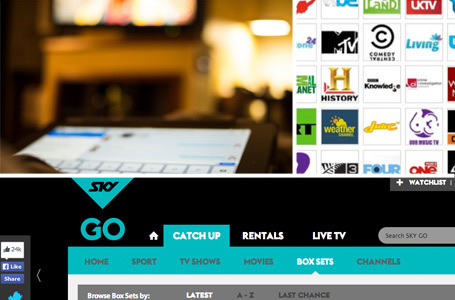 Insights from this project fed into new product development and an upcoming redesign of SKYTV.co.nz. Client: My alter ego – Mr. Tappy. Location: My kitchen table, and 30 countries. Yes, from kitchen table to global tech giants in 2 years and just 700 easy steps. My side-project, Mr. Tappy, (a product I’ve developed to help film people interacting with mobile devices) continued to surprise me with sales to the point where I can nearly hear myself blush when I see my list of customers. Taking this product to market has been a humbling learning curve for me. Even when working alone I find myself being design, marketing, sales, distribution, customer service, etc., discovering how easy it is to work in silos and lose customer focus – Something nobody can afford to do, especially when your customers are expert product evaluators. Having ‘skin in the game’ has resulted in greater respect for my design research clients‘. Running day to day operations, and shipping product is challenge enough let alone keeping an eye on customers. This first hand experience helps me understand my role as a design researcher with each client. The entire product is made right here in NZ (some in my home workshop) and the next iteration will ship with a purpose designed HD camera. We’ve all been stuck behind one on a hill on the way to the beach, but what’s it like to buy a home, and a vehicle at the same time? We set out to find out. 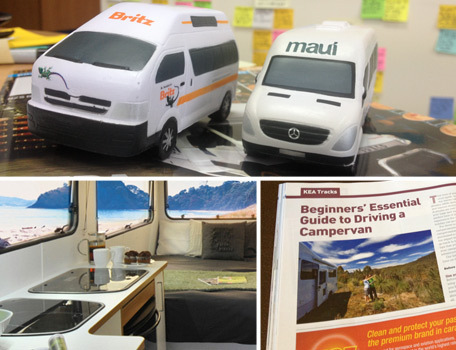 I worked alongside Ed Burak, THL’s lead experience designer to provide research muscle on a project around motorhome sales. Motorhome buyers are a fairly relaxed bunch, usually at retirement age and with some time on their hands, but buying one of these rolling holiday homes is not always a holiday. 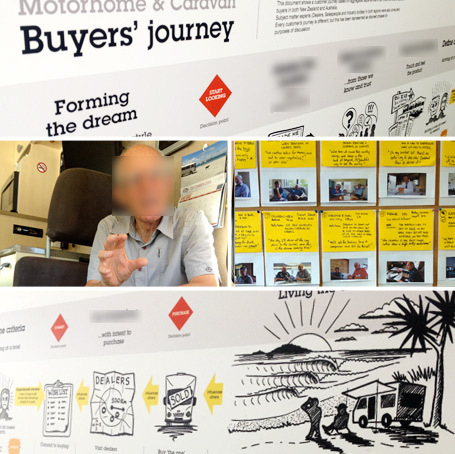 From a few dozen interviews with owners, buyers, salespeople and experts, we poured our insights into a customer journey map highlighting parts of the buyers’ journey where the experience could be improved. … and as you’ll see, some of my illustrations for the journey map were verging on the autobiographical. Yes, the waves were always like that in my memories. All the talk of holidays and time away was perfect timing for the end of 2013 and inspired me to use the caravan (which was once my office) a few times over the Christmas period. Good timing. If you missed my previous post, here are the first four dream design research briefs from last year. This entry was posted in Better by Design, Customer experience, Customer insights, Design ethnography, Design research, Favourite projects, Mr. Tappy, Uncategorized, User research, UX methods by Nick. Dream design research projects from 2013, Part 1. When I moved from design into design research, I dreamed of projects like these. 2013 was the year they arrived. Contexts ranged from hospitals to homebrew, motorhomes to mobile devices, television to truck driving. I was repeatedly humbled and surprised by the people I worked with, both research subjects and my client collaborators. The most sensitive environment and subject matter I’ve worked with so far. 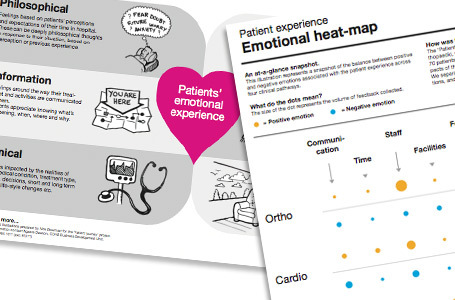 I worked with hospital staff on wards and at patients’ bedsides to capture in-patients’ emotional responses to the experience of their stay. After discharge we visited patients and their families at home for a reflection on the experience. A clear picture emerged, of what matters to a patient, from environment, to information to service, and their associated feelings. 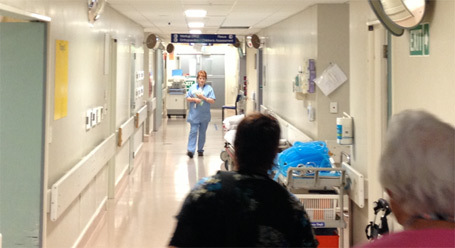 Together, the team formed key design principles to meet the emotional needs of patients. In some interviews I used live-sketching to capture notes, It was fun so I wrote a short article about my technique, with ‘top tips’. Later, in a GIANT warehouse, I helped lead a series of ward design / prototyping exercises with a super diverse set of stakeholders – from cleaners to clinicians, anaesthetists to architects. 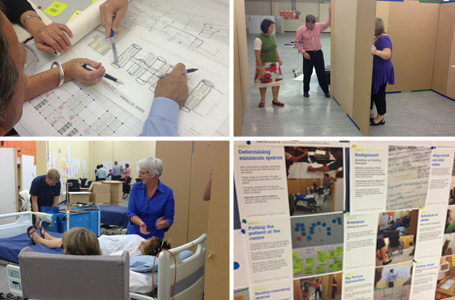 I worked with a team of anthropologists and architects from Seattle-based design agency, NBBJ to facilitate full-size prototyping and simulation exercises, using cardboard for walls, medical staff and actors to test various scenarios of use. Those cardboard walls in the photos are a system called Mockwall designed specifically for spatial prototpying. Since then the CDHB team have taken the prototypes through to a convincing level of detail where they can be validated through ‘almost real’ use. You can watch a short video showing where they’ve come to. 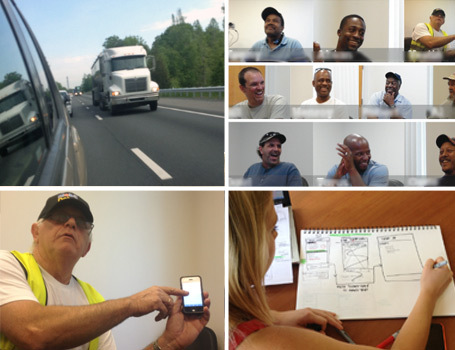 I was dropped into Richmond, Virginia and the world of the long haul trucker. As I found out, Richmond is smack in the middle of the Interstate 95, the busiest highway on the east coast, connecting 15 States. My role was to capture the voice of the driver, the way they communicated on the road and the information they handled along the way. Big rigs, 53 foot trailers, truck stops and the dedicated ‘tribe’ whose mantras were either ‘live to drive’, or ‘drive to survive’. After a few days of interviews I was talking their language of lumpers, spots, hooks, dead-heads and bob-tails. I worked in classic diners and freight depots, alongside product managers to inform the design of plan an app to let drivers spend more time eating up highway and less time worrying. 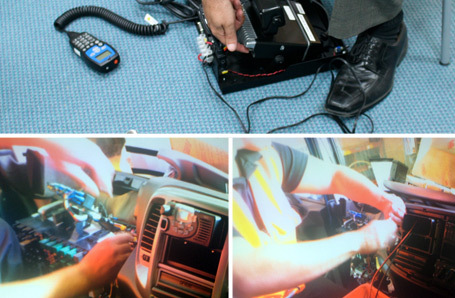 To help Tait adopt a user centred approach to product development I planned and facilitated a rapid ‘learning by doing’ user centred design workshop focussing on installation of their in-vehicle radio systems. 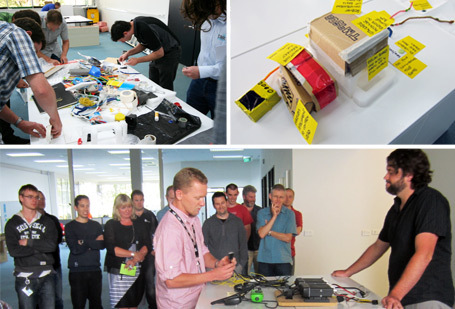 This was a hands-on capability-building activity focussed on a specific project with the idea they could roll out the same approach on other projects. I coached the team around research and analysis techniques, then took them through to prototyping and testing their concepts with their live customers. I loved seeing engineers dig deep to define customer needs, then work together with plasticine and pipe-cleaners, receiving valuable feedback before moving designs forward. “What is the purpose of your visit to the UK today sir?”, became what is the experience of travellers entering UK borders?. 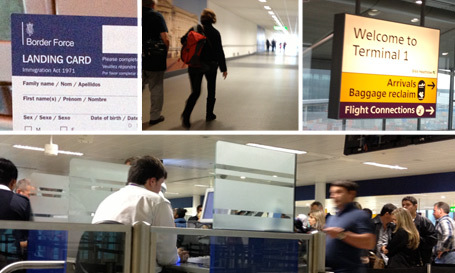 This was a dream opportunity to work in airports, a context I’ve always been intrigued by. Unfortunately, with my curiosity at it’s peak a week into this project, the project timeline shifted and I couldn’t eat into my next project in NZ, so frustratingly found myself experiencing the NZ border entry earlier than expected. …Maybe another time. The rest of the year saw me into the world of craft brewing, TV, motorhomes and wrangling supply chain, sales and distribution with my own side project, Mr. Tappy. I’ll save all these for Part 2. This entry was posted in Better by Design, Customer insights, Design ethnography, Design research, Favourite projects, User research by Nick. I’ve been willingly doing myself out of a job, and it feels great. Since 2013 I’ve been on the design integration coaching team for Better By Design, and you’ll see on this page why I’m humbled by the company I keep. 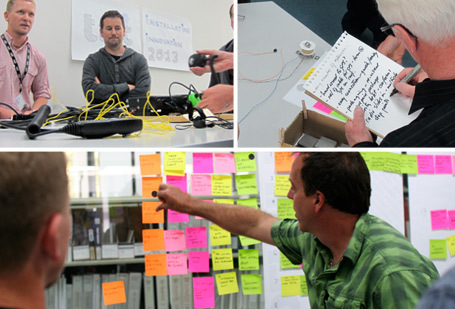 Inspire and enable New Zealand businesses to success by design. Our mission is to assist companies increase their international competitiveness through the process of design integration. Each ‘design integration coach’ has a specialism. Mine is customer insights and user centred design, a core part of my design research consulting practice. So how does this mean I’m doing myself out of a job? the answer is right there in the word coaching. The programme exists to build design capability within the staff companies already have, rather than make them reliant on external consultants. Design often begins with design research, so this is where I step in as a coach – taking people away from their desks to learn new skills while gaining valuable insights for their business. This is a new way of working for me, and has me thinking about what I do from a fresh perspective. I’ve been consulting for 12 years – starting with being what I now see as a ‘hit and run’ gun for hire, then moving towards a more collaborative approach, involving clients where possible to help them benefit from the process. 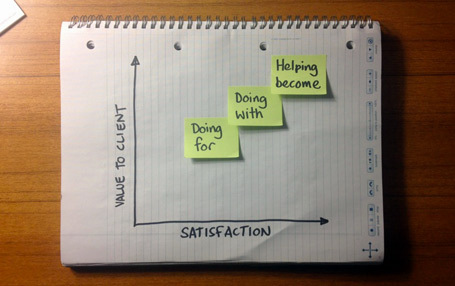 …but coaching is about more than collaboration and as the crude graph above shows, it feels like a step up in value to client and satisfaction to me along the way. My first client in this programme is now able to plan and run their own projects. Next step is for those involved so far to coach their colleagues to their newly-found skill level. Despite the feeling of being less useful to the client over time, seeing them make increasing use of the skills like this is a real buzz. All ‘teach a man to fish’ proverbs aside, I’ve found this to be a hugely rewarding way to work, with lasting value. If you’re a freelancer or consultant and have a client who could benefit from bringing the skills you offer in-house, take them on the journey. It’s a win-win. This entry was posted in Better by Design, Customer insights by Nick. “It’s not about going from left to right and some magic happens on the other side, it’s about understanding the intention”. 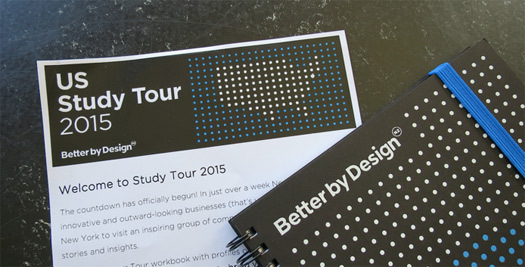 …Said Director of Design Innovation at Intuit, a stop on the Bettter by Design Study Tour I was part of in 2012. During our visit, Intuit shared how design thinking changed the culture, and profit of the company (eventually). Their story: How they tried and failed to install ‘design as a process’ into their teams, arriving at a more engaging and successful model of ‘principles’. 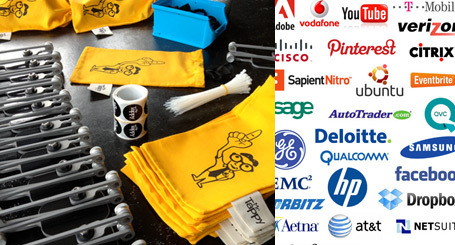 Design thinking – to the rescue? With a history of incremental usability improvements but no real innovation, Intuit took a big swig from the design thinking cup. Their aim was to integrate design thinking into the business, to be more user-focused – exceeding customer expectations, rather than just meeting them. “We made a mistake in that we started with design thinking as a process, when we brought a process back to Intuit, they puked all over it. Because in a culture where; product development has an agile process, marketing have a go-to-market process and legal have a compliance process, they couldn’t reconcile the design thinking process on top of theirs, so they did nothing”. So, the conventional design thinking process wasn’t flexible enough for the realities of their culture and practice, and it simply wasn’t engaging teams. To replace the rigid ‘process’ approach, Intuit arrived at three principles to underline all development work- teams could use whatever methods they liked, so long as they adhered to those principles. 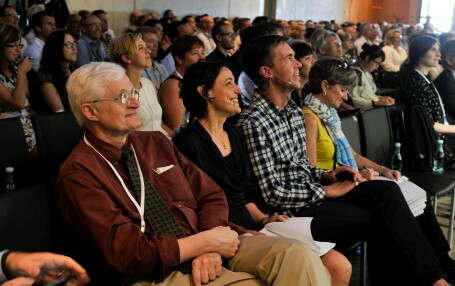 “A seminal moment in our journey was when we took the process of design thinking and made it into principles. It’s not about going from left to right and some magic happens on the other side, it’s about understanding the intention behind these principles, then you can make it your own”. “We have watched teams come up with their own methods and tools at any time in the process and it totally works. Thats when we saw uptake in the culture, when we started to see behaviours change, when we gave them permission to make it their own”. Sounds like a win to me, especially if this has taken hold in an organisation of thousands. So, how do Intuit involve customers in their design process? To deliver on their first principle, (apart from their dedicated UX team) Intuit has committed to getting their teams out of the office and into the context of their customers using their products. Unsurprisingly, this has proven to build empathy for the customer, and as a positive bi-product, engagement with the ongoing design process. “We went from listening and fixing problems, to watching to find what they really need but can’t tell us. This changed the way the organisation makes decisions by watching people’s behaviours versus listening to what they say”. This entry was posted in Better by Design, Customer insights, Design Thinking, Empathy, Insights, UX methods by Nick.